Kevin Brown of the Diglotting blog posts about some very interesting books. One of these is Iesus Deus: The Early Christian Depiction of Jesus as a Mediterranean God which, being available on Kindle, meant I splurged on the spot and now have it waiting impatiently on my desktop to be read. But investigating this book led me to another by the same author, M. David Litwa. (An initial appeal of Litwa, by the way, lies in his being a historian and teacher of Greek rather than a theologian.) 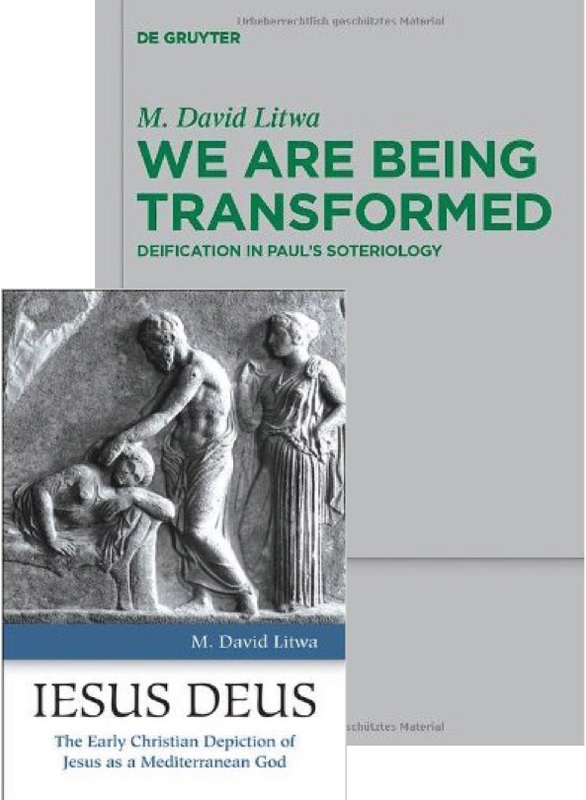 That other title is We Are Being Transformed: Deification in Paul’s Soteriology. I may read this one first though it’s only available on a database at the university where I work. The argument of this book has been that aspects of Pauline soteriology fit the basic pattern of deification in the Greco-Roman world. I defined this basic pattern as sharing in the divine qualities which are constitutive of (a particular) divine identity. In chapter 1, I narrowed these qualities down to two: immortality and power. In chapter 2, I tried to show that (1) deification was a pervasive and multi-faceted idea in the Greco-Roman world, and (2) that it sometimes featured human beings as assimilated to specific Gods.